By coincidence, the two classes this week both learned tunes with Cork connections. The SMG Whistlers class learned the first of two polkas that I learned from County Cork flute player Conal Ó Gráda many years ago at a workshop in Belfast. He didn’t have a name for either tune at the time, but Not for Joe and Mrs. Crowley’s are two titles that I have recently found for it. Conal Ó Gráda has a very powerful and distinctive style that turned the heads of many people when they first heard his initial recording The Top of Coom. He now plays with The Raw Bar Collective and their web site has a great introductory 16 minute video that is worth checking out. I originally taught this tune as part of the original FluteFling afternoon workshop in 2012 and the music for the tunes that day can be found here (PDF). It’s also here in some tunes I put together for set dancing (ABC format). Meanwhile, the regular FluteFling Improvers group looked at the second of two Terry “Cuz” Teehan highland flings, The Road to Glounthane. Solidly in A major, but conveniently avoiding G# and interestingly D as well, I suspect that parts of it may well be in E major, but in an an ambiguous mode. Things went so well in the class that we ended up recording it, so thanks to everyone for agreeing to share it. 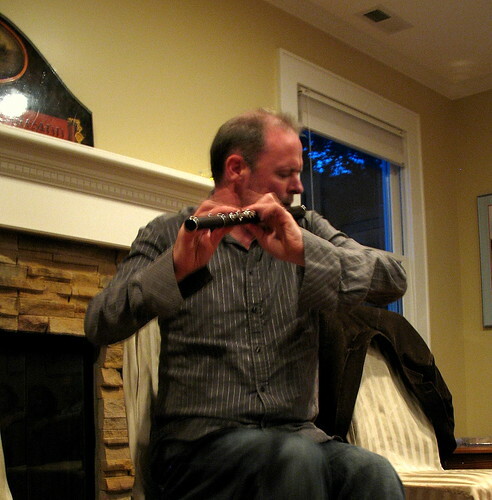 Resources for the tunes can be found on The Flow as usual, which is my Irish/ traditional flute resource site. Photo of Conal Ó Gráda CC Michael Curry, some rights reserved. This entry was posted in Community, FluteFling, Scots Music Group, The Flow and tagged beginner, highland fling, improver, Irish, polka, Scots Music Group. Bookmark the permalink.